Dimensions 2.50 by 8.50 by 9.25 in. Homemade wonton soup in 30 minutes. Chicken Parmesan without dredging and frying. Fruit crisp on the stovetop. The secret to cooking fast is cooking smartÃ¢ÂÂchoosing and preparing fresh ingredients efficiently. How to Cook Everything Fast is a book of kitchen innovations. Time managementÃ¢ÂÂ the essential principle of fast cookingÃ¢ÂÂ is woven into revolutionary recipes that do the thinking for you. YouÃ¢ÂÂll learn how to take advantage of downtime to prepare vegetables while a soup simmers or toast croutons while whisking a dressing. Just cook as you readÃ¢ÂÂand let the recipes guide you quickly and easily toward a delicious result. Bittman overhauls hundreds of classics through clever (even unorthodox) use of equipment and techniquesÃ¢ÂÂencouraging what he calls Ã¢ÂÂnaturally fast cookingÃ¢ÂÂÃ¢ÂÂand the results are revelatory. There are standouts like Cheddar Waffles with Bacon Maple Syrup (bold flavors in less time); Charred Brussels Sprout Salad with Walnuts and Gorgonzola (the food processor streamlines chopping); Spaghetti and Drop Meatballs with Tomato Sauce (no rolling or shaping); and Apple Crumble Under the Broiler (almost instant dessert gratification). 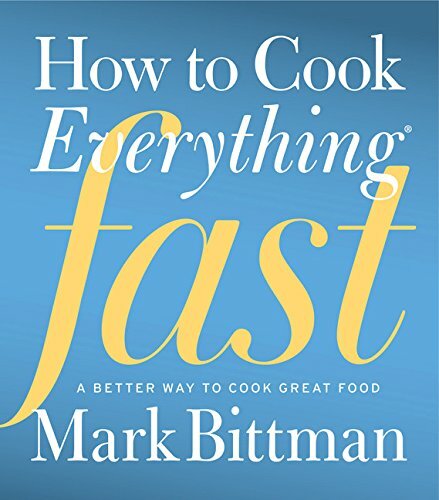 Throughout, BittmanÃ¢ÂÂs commonsense advice and plentiful variations provide cooks with freedom and flexibility, with tips for squeezing in further shortcuts, streamlined kitchen notes, and illustrations to help you prep faster or cook without a recipe. How to Cook Everything Fast puts time on your side and makes a lifetime of homemade meals an exciting and delicious reality. About: Homemade wonton soup in 30 minutes.